As Chris noted earlier this week, we sent out a large mailing of our “I Love EzineArticles” mugs and, based on the number of emails we are receving, they are starting to arrive at their new homes (for the most part intact). We received our first 2006 “mug shot” from EzineArticles expert author, Patsi Krakoff. Patsi also mentioned her new mug in her blog (Ezine@rticles: I Love You Too! 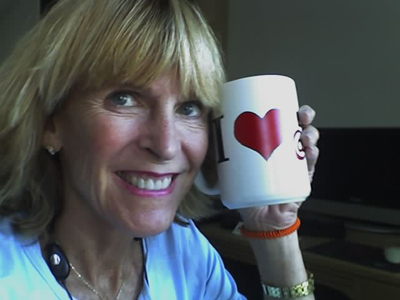 ), as did EzineArticles expert Stephanie Mulac in her site (Ezine Articles Coffee Mug Speaks a World of Thanks). Have a “mug shot” of your own? Send a 500 pixel shot to support “@” ezinearticles.com and we’ll add it to this blog entry. I still use my mug from last year. It’s great for cappuccino, just enough room for cream and a sprinkling of cinnamon and sugar. I’m off to check out your blog. Great “mug shot” Patsi! I really like the idea of putting on a web site or a blog. The mug is a great marketing idea. I look forward to using mine as a penci/pen holder. I’m an avid collector of writing instruments. The mug sitting beside my keyboard will be a constant reminder to get busy writing those articles.